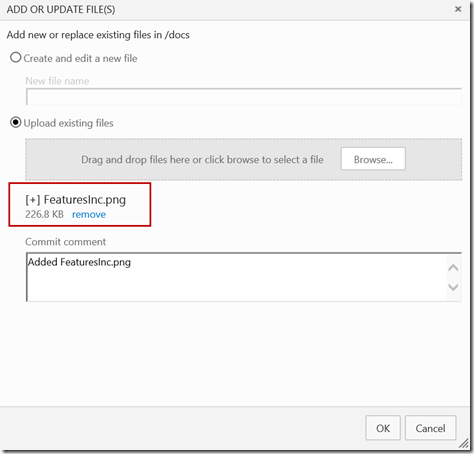 With the latest deployment of VSO a bunch of great improvements for content editing was released. 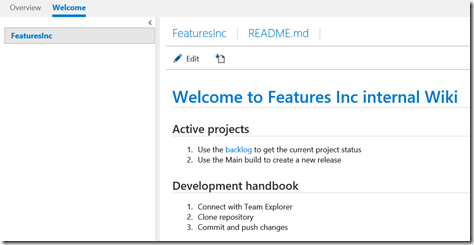 Take a look at http://www.visualstudio.com/en-us/news/2014-dec-17-vso for the complete list of additions. The feature I’m most excited about in this update is the “Quick code editing” tools. With these changes we now have decent in-place editing capabilities in the VSO Web UI. 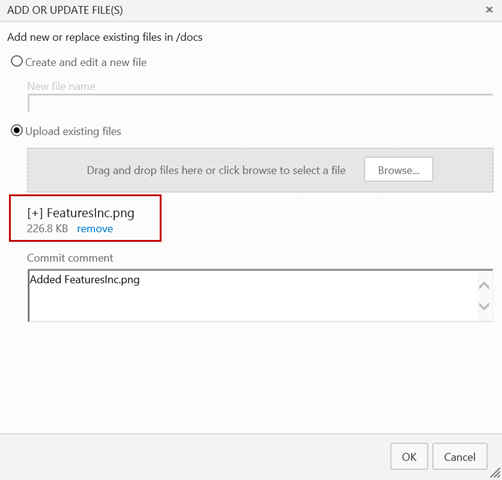 It’s easy to add (new or upload) and edit files. 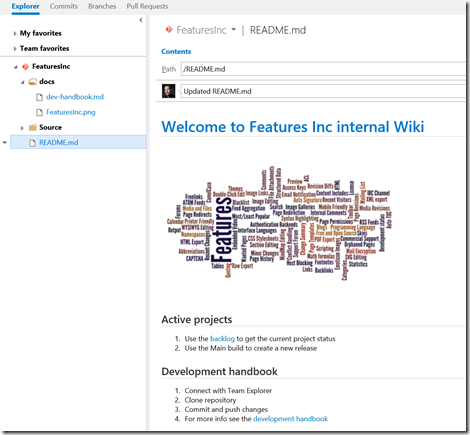 One thing I’ve been waiting for is the ability to use VSO for my team documentation in a Wiki-style way. Now the enchanced editing tools and the fact that VSO supports Markdown files I can finally do this in a good way. All my content is conveniently stored in version control, which makes authoring (using any tool) very easy. And I’ve got complete tracability as well, something that can be very useful when managing this kind of dynamic content. Here is a quick walk-through just to show how easy it is to get started. First we need to create a start page. Switch to the Welcome page on the VSO home page. 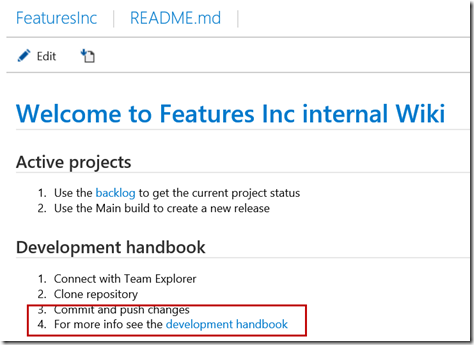 Initially you will get a default page with an instruction on how to get started. 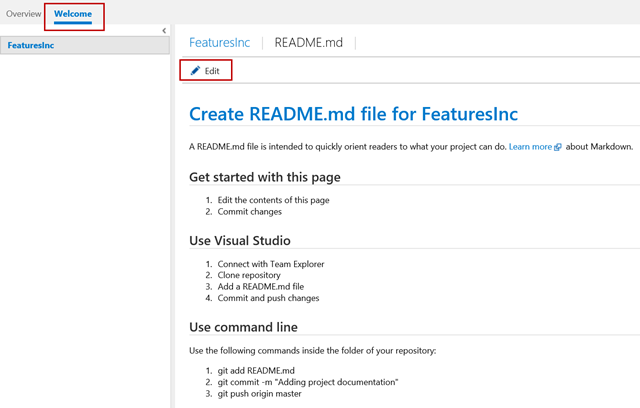 Click the Edit button and you will switch to the Markdown editor for the README.md file. In the example below I’ve added some initial content, including a link to the backlog for the team. Use the preview tool to check out the layout before saving. 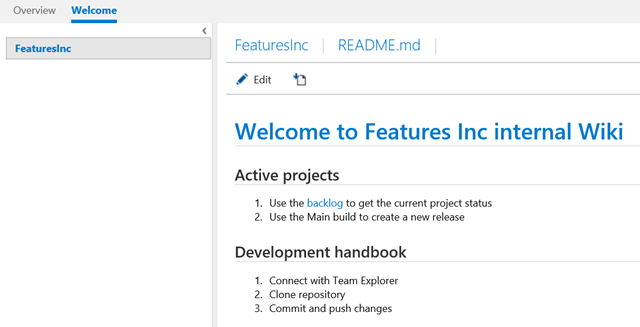 When you are happy with the page, save it and the README.md file will be added at the top-level in your repository. Now with the start page in place it’s easy to add more content. If you add links to sub-pages you will get the option to automatically create them just like the welcome page. 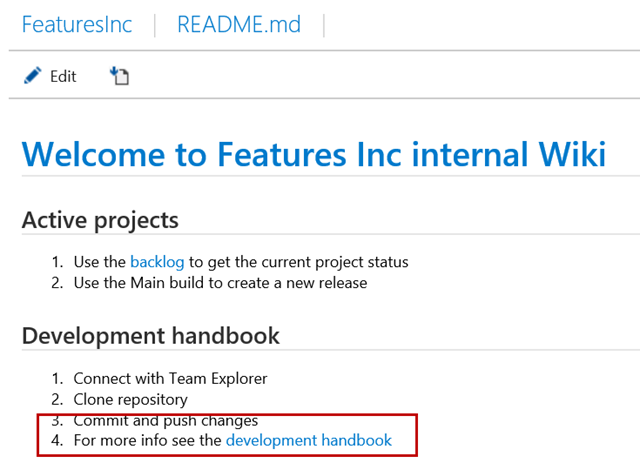 Note: it’s a good idea to create a structure for your documents, in this case we’ll add the dev-handbook.md in the docs folder in source control. 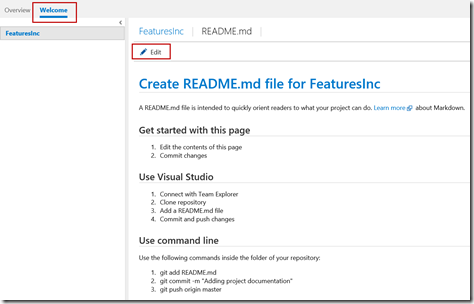 Saving the README.md file now gives you a link to a page that doesn’t yet exist. Next you can add new or existing items to that folder, in my case I’ll be adding a logo to our wiki. I want the image on the welcome page so next I’ll edit the README.md file again and add a Markdown link to the image I’ve just uploaded to the repository. Save the file and look at how nice the wiki looks with the image inplace. If you want a richer editing experience then you can use any Markdown tool to author the content. The only big difference is that you need to sync the files in the repository yourself. But if you are a developer then using a TFVC or Git client is nothing new so that shouldn’t be a challenge. 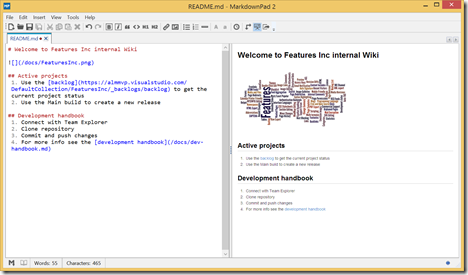 In the example below you can see what it looks like editing using MarkdownPad. Subscribe to comments with RSS or TrackBack to 'Use Visual Studio Online + Markdown as your Wiki'. D you know when will this be supported for on-premise installations? Hi, this will be included in TFS 2015. The RC is out if you want it now.